Diamond Fuji at Mt Ryugadake (ダイヤモンド富士初日の出) happens on New Year's Day. 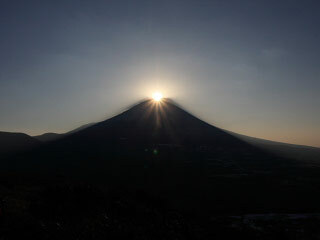 The phenomenon of the sun seeming to rise out of the summit of Mt Fuji is called Diamond Fuji. It is the most popular the New Year's sunrise spot in Japan. Mt Ryugadake is a popular hiking spot located in Yamanashi prefecture and is 1,485m high. There is parking as well as restrooms at the Lake Motosu Campsite. It takes two hours to walk to the top of the mountain, but many people visit to see this event on New Year's day so it will be very crowded. There is no public transport operating at this time of night, so you need a car. The parking area is located at Lake Motosu.